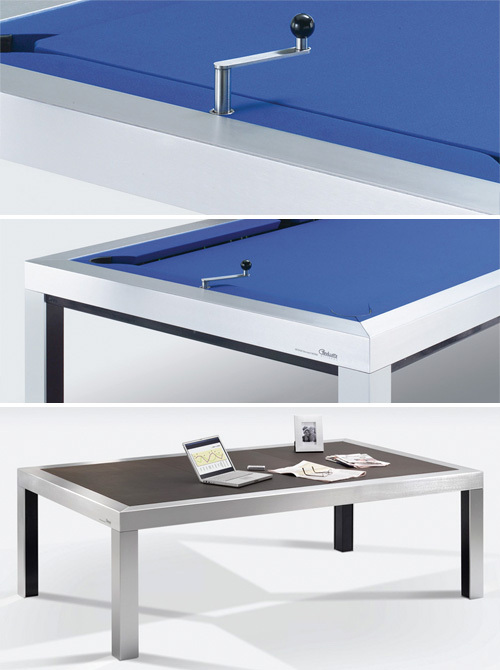 Don’t have the room for both a billiards table and a work desk/dinner table in your small home? Well if you can cough up $20,250+ (£12,497) that’s one less home furnishing decision you have to make. The oddly named Very(Tables), from French company Chevillotte, is another one of those converting billiard tables that hides it’s true nature when guests are over for a meal. Instead of just slapping a 3/4-inch piece of plywood and a tablecloth on top of your standard pool table like most civilized folk do, the Very(Tables) features a cranking mechanism that raises the table’s playing surface until it’s flush with the table’s edge. Underneath the table is a web of metal wires that serve to catch and collect the pool balls as they’re sunk, as well as removable ‘plates’ that sit atop the playing surface when it’s raised so you don’t damage or stain the felt. I guess the fact that the table’s clever engineering means that it’s just 4 inches thick might be worth the price tag, but I haven’t got my chequebook out just yet. Of course if you’re already dropping that much money on a pool table, I doubt you’ll want to spend your time manually cranking it up and down. So you’ll probably want to go for the motorized option, which adds an additional $4,500+ (£2,797) to the bottom line.